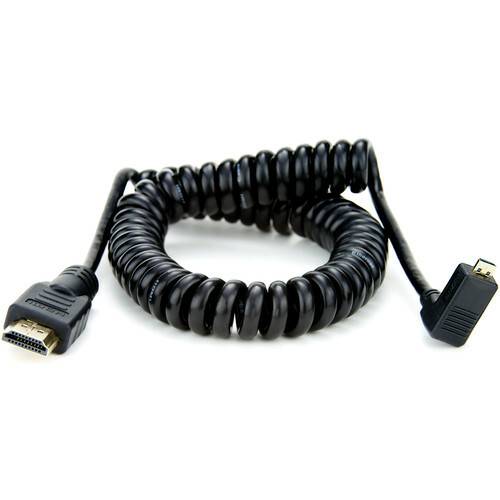 Coiled Micro to Full HDMI Cable (19.7") is rated 3.6 out of 5 by 9. Rated 2 out of 5 by John T. from faulty either by design or bad luck I used this product to go from my Blackmagic Pocket Cinema Camera to my Atomos Ninja Blade for dual recording. I bought this product because it was coiled, but that is a mistake in hindsight. The coil gave the wire buoyancy and heaviness it didn't need and I kept getting the dreaded black screen with no input on the atomos with any slight movement of the tripod. HDMI connection doesn't lock like SDI so either the inherent design was faulty or the wire was faulty itself. The review I gave was to explain the former. I replaced this with an uncoiled cable, but it thru its paces and it didn't give me any problems. Rated 1 out of 5 by Nguyen from Too bad for advertising images Why is it different when taking photos of the product, but actually the assembly on the Sony A7 Mark 3 is different from the packaging image? The direction of the cable must have turned to the back of the cameras screen, but the fact that it was inserted was completely different, and made it very difficult to operate. Both products I order are the same. How can the store handle it ??? .. because I am in Vietnam, especially when I come to Vietnam I have to pay customs tax. If I were in the United States, I would definitely return, and ask the shop to fix all the costs I paid. Rated 4 out of 5 by Diego from Almost Perfect The quality of this cable is without a doubt perfect. The only beef I have with this is its minute weight from my Movi M5. I would've loved if the cable was thinner. Other than that, this cable is perfection itself. I recommend it. Rated 5 out of 5 by Seth from Robust Cable Cable seems robust. I clamp it in with my shogun cage so it does not slip. I will probably change to a lockport type camera cage and need the full cdmi-hdmi. Rated 5 out of 5 by Anonymous from Perfect for dji ronin i bought this to use with my DJI Ronin M and it is the perfect length. the right angle micro hdmi doesnt limit the motion of the ronin like other cables. Rated 4 out of 5 by Obama of Skateboarding from Perfect for the job I use the coiled micro cable for my Gh4 and Ronin M set up. This was just what i need to get me up and completely running smoothly. Rated 5 out of 5 by J from Works great I like the convenience of the coil and have had no trouble with this cable at all. Used with FS7 to Shogun. Is this cable supports 4K 30fps and 1080 120fps?I want to use my shogun flame with my Sony a73 is this the correct cable? Confirmed: Shogun Flame 2017 uses full HDMI - there are no slots for micro - HDMI. So this not the correct cable.